Patients in Dallas, Ft. Worth and Arlington, Texas suffering from chronic back pain and leg pain now have a new treatment option from Nevro called the Senza® HF10 therapy that is paresthesia-free and is clinically proven eliminate back and leg pain. "In the past, spinal cord stimulators caused paraesthesias and lost efficacy in as little as six months for some patients,” said Dr. Andrew Cottingham. “Patients also needed a remote control to frequently adjust their settings. HF10 therapy has been a revolutionary advancement in spinal cord stimulation and pain control. 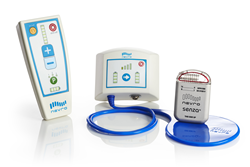 Now patients can have drastically improved, long-term relief of chronic back, neck and/or extremity pain without the paraesthesias or need for a remote control." Patients who have chronic back and leg pain experience abnormal pain signals that are sent through the spinal cord and into the brain. HF10 therapy calms the nerves that carry these signals to provide lasting pain relief. In a simple procedure, thin insolated wires are inserted in the back near the spinal cord and connected to a compact battery-operated pulse generator, which is implanted just under the skin. HF10 therapy sends mild electronic pulses to the spinal cord to calm the nerves returning them to a more normal state. Pain management physician Dr. Berlin said, "High frequency spinal cord stimulation has dramatically changed our outcomes for treating patients with low back pain with or without leg symptoms. In the past, patients have had limited choices for long-term pain relief for chronic low back pain. Our experience with HF-10 therapy so far has been remarkable. Most of our patients implanted with this new technology have been completely weaned from all their narcotic analgesics and have returned to a normal drug free life. Many of our patients remark that they are pain free for the first time in years." A study by the Journal of the America Society of Anesthesiologists found that HF10 therapy lead to a substantially positive impact on the management of back and leg pain. 8 out of 10 patients who have used HF10 therapy experience significant, lasting relief from back and leg pain allowing patients to return to their everyday activities. The HF10 therapy procedure is quick, minimally invasive and may not require a hospital stay. Patients who have gone through failed surgery, or failed pain management treatments to alleviate back pain and leg pain are strong candidates for HF10 therapy. Before fully committing to the treatment, the doctors at OPTIMAL will assess the effectiveness for each individual patient. 9 out of 10 patients who try HF10 therapy stick with the treatment. To learn if you are a candidate for HF10 therapy, please click here: HF10 Therapy. Regenerative medicine physicians Dr. Scott Berlin, Dr. Andrew Cottingham and Dr. Michael Phillips strive to be at the forefront in providing leading edge interventional pain management and regenerative medicine options to patients in Dallas, Ft. Worth and Arlington. All double board certified in anesthesiology and pain medicine, their collective expertise includes a full range of treatment options. No matter what your stage of life, OPTIMAL delivers comprehensive, current and most importantly, compassionate medical care.